Advantage for dogs is a fast acting flea medication, protecting against fleas two hours after application and killing any preexisting flea life within 12 hours. Advantage II protects against every stage of the flea life cycle (eggs, pupae, larvae, adult), as well as lice infestations, and lasts for a full 30 days. Also completely waterproof, there is no need to stop that water-puppy from taking a dip. As with any topical treatment, skin irritation may occur as a result of using Advantage for dogs. If irritation does not subside or worsens, contact your veterinarian. Do not combine with other spot-on flea treatments, unless recommended by your veterinarian. Advantage for dogs contains Imidacloprid and Pyriproxyfen. 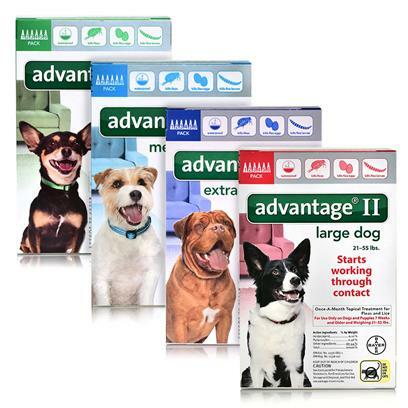 Advantage II for Dogs is intended for use on dogs and puppies 7 weeks and older. Medication should be applied once a month, being careful to give the correct dosage based on your dog’s weight. Solution should be applied along the back of the dog, in 1-3 locations between the shoulders and base of the tail. The number of application spots should increase along with the weight of the dog (<20lbs = 1 spot, +20lbs = 2-3 spots). Part their fur and carefully apply solution directly to the skin, making sure there is no excessive run-off. Allow 1 hour for Advantage II to dry.